5) Enter amount of Rs 50 or more & click on Pay Now. 6) Repeat this for 4 other friends and send them Rs 50 or more also. 6) Thats it. Your cashback will be processed only after the 5th successful transfer within 24 hours. 4) The minimum transfer amount is Rs.50. Tags:- FreeCharge share and Earn , Freecharge send Rs 50 to 5 friends and get Rs 25 Cashback. 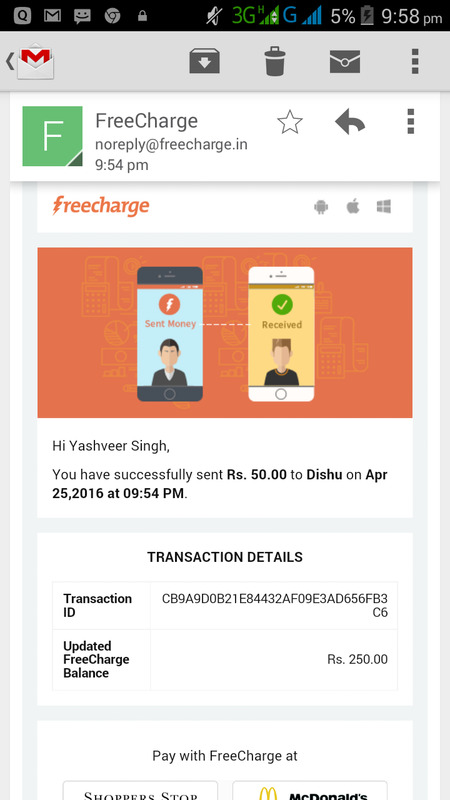 You need send Rs 50 to your friends accounts and You will receive Rs 25 Cashback from freecharge. you will receive within 24 hours only as per the Terms & conditions. Admin Bro.. Is this offer valid for old users . And if we already have sended the money and recieved can I elligible for this offer. Its not mentioned in Terms & conditions, So may be it will work. Sent 50 rs each to 5 persons but got no cashback. Have u tried this offer? you get the Cashback within 24 hours. why not able to send cash….it is showing failure message…..
is it credit as per one friend rs 25 or after sending 5 friends. i mean i have to send atleast five friends. Yes.. you need send to 5 friends then you get Rs 25 as Cashback from Freecharge. what is the maximum limit of sending friends ? You can earn only Rs 25 per Freecharge account. Is it valid on transfer to old FC users? or i have to transfer new users? All freecharge users. Not Verified because it will take 24 hours. May be it will work… But Not sure 100%. @admin…..receiver ka receive krna jaruri h kya….means tabhi cashback milega….ya phir bssss 5 frnd ko send kiya or eligible ho gaye cashback k liye….??? Mujhe total 125 milega ya fir sirf 25 milega please batao. can I send money same friends to again and again? No.. you need send Rs 50 to different friends (Not same). Balance sending failed ho rhi hy kyu? Mera 2 Ac block ho geya. jabse mein freecharge pe spin kiya. email kiya per usne kaha unblocked kar diya. aavitak unblock nehi hua. friends please koyi Freecharge pe 4 time Spin na kare..nhI to block ho jayega. Contact their Twitter page. They unblock you soon. They give you proper reply here. block se pehle mein is a/c spin kiya tha. Spin karne ke baad block hua. Admin Aapka koyi A/c hai jisne 4 baar spin kar sakte hai. Kiyu ki 4time spin kiya to a/c block ho jayega. please Contact freecharge for more information. Mene 6 time kiya.. Mera to hua nahi block.. Send Money is also an option in the Windows Phone, Windows Phone Can I…?? As per the Terms & conditions, it valid for Android users only on Latest version. Fake offer…. I contacted to fc but they are denying for same. Pls don’t post fake offer. No information regarding this.. We will update you, once i got Latest information. Ye cashback kab tak aayega ? After 24 hours of your 5th transaction. Freecharge blockd my 3 accounts. What can I do? Is there any procedure to enable this account. Admin still I haven’t received the cashback… Did anyone got?? ni milta h bhai 2 a/c se 5-5 different freecharge a/c me transfer kiya tha maine jvi 1st tym tmne ye post kiya tha.. 1st tym tmhara koi trick kam ni aaya h.. or freecharge se contact krne p response mila ki aisa koi offer unlog k pas ni h offer ka source btane bola..
Also Freecharge Posted on their Facebook Page about this offer.. Note:- i don’t know what happen last time..
Got cashback in one account. Frnd ko send kiya money fir se apne ac. Me transfer kar sakte h.
Can I use unlimited time? Per device can i log our and log in with different ac and do the same procedure????? Is it valid once per device? Bcz once I have got it but second time I haven’t received….. Did anyone tired?? don’t know.. Not Tested by us. Guy’s Don’t risk your multiple freecharge accounts for just rs.25 , Freecharge is strictly monitoring now a days for fake accounts and blocked immediately even if you have money in your accounts. Its freecharge unofficial method for tracking fake accounts ! BEWARE ! May be they block because you do some illegal work like- transfer voucher credits money to banks etc. This offer was a testing one . As soon as i tried with 2 accounts to send 50 rs to other it got blocked immediately..
Admin j offer aj bi valid hy kya?